There’s a killer on the road (*), and his name is "Amaral Lector". This is what most readers of British Media should think, after what was published by tabloids like Daily Express and Daily Mail, about Portuguese CID Chief-Inspector Gonçalo Amaral, the man in charge of the investigation of Madeleine disappearance. That "killer", Gonçalo Amaral, has tortured a poor mother of "another missing girl", (a girl that vanished like Madeleine McCann, right?) as Daily Express wrote. 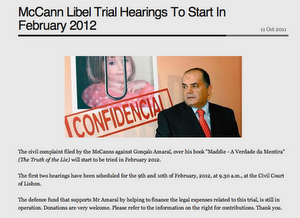 Several emails and comments posted at my page reflected the conclusion their authors arrived, after being so accurately and precisely informed by British journalist about what happened to Joana, an eight years old girl, daughter of Leonor Cipriano, the poor mother tortured by "Amaral Lector". And so, here we have a terrible story of a dysfunctional family, a child murdered and a very difficult police investigation. 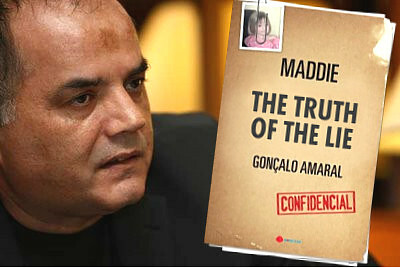 The only thing – in my humble opinion - that has some similarity with Madeleine McCann disappearance is the fact that the person in charge of Madeleine’s case is the same that successfully headed Joana Cipriano investigation: CID Chief-Inspector Gonçalo Amaral. And success, in Joana’s case, is clear: the murderers were found, accused, went to court, they were sentenced, they appealed the sentence and the Portuguese Supreme Court reduced it to 16 years of jail to both of them – the mother, Leonor Cipriano and her brother, for the murder her daughter and nice, eight year old Joana Cipriano. If many "consumers" of British Media have another idea, that’s because most British journalists covering Madeleine McCann abduction strongly believe that truth never should be allowed to "kill" a good story. Even if I means destroying the reputation of an experienced CID Chief-Inspector. "And what’s the problem?" – I imagine my British colleagues asking themselves this question, with a pint of Guinness in the hand, enjoying the sunshine at Praia da Luz. "The guy isn’t even British, he’s just a Portuguese…"